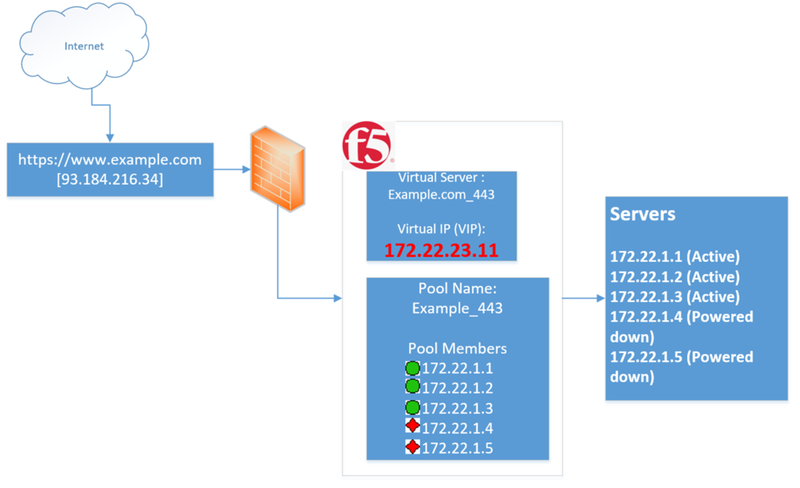 In order to understand deadlocks, let us first create tables and have some sample data. 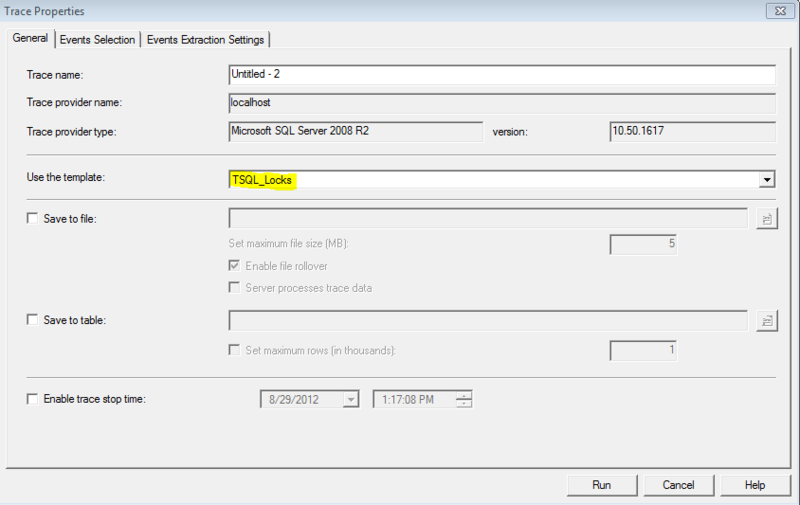 Open Sql Profiler and use the “TSQL_Locks” template. 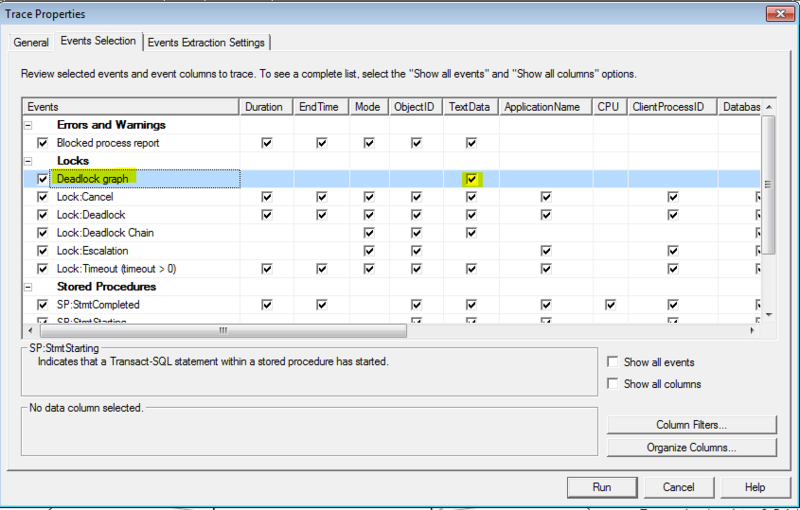 In the “Event selection” tab, make sure you have “Deadlock Graph” selected and the click “Run”. 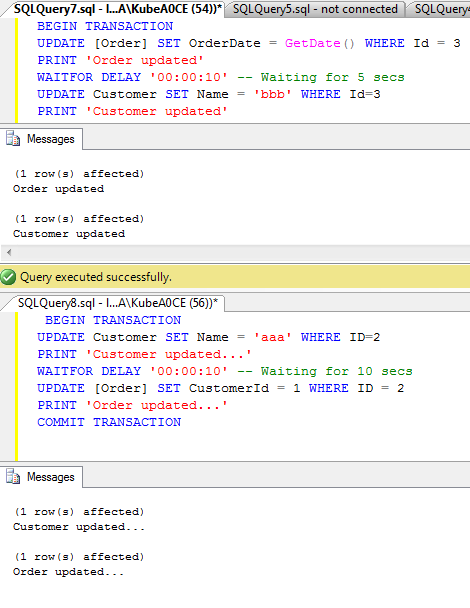 In SSMS, open two new query windows and execute the below batches in those two separate windows at the same time (Hit F5 in one window, switch to the another and hit F5). You will notice that the batch 1 transaction took affect but because batch 2 couldn’t as that was identified as deadlock victim. Look at the profiler now. Notice that the Batch 2 didn’t get committed (See the big blue cross on the left circle and the tool tip on it in the above screenshot from the profiler?). However the Batch 1 did go through and took effect (see below). Note that If the above batches (separate transactions) were updating two different records at the same time, there wont be any deadlocks. 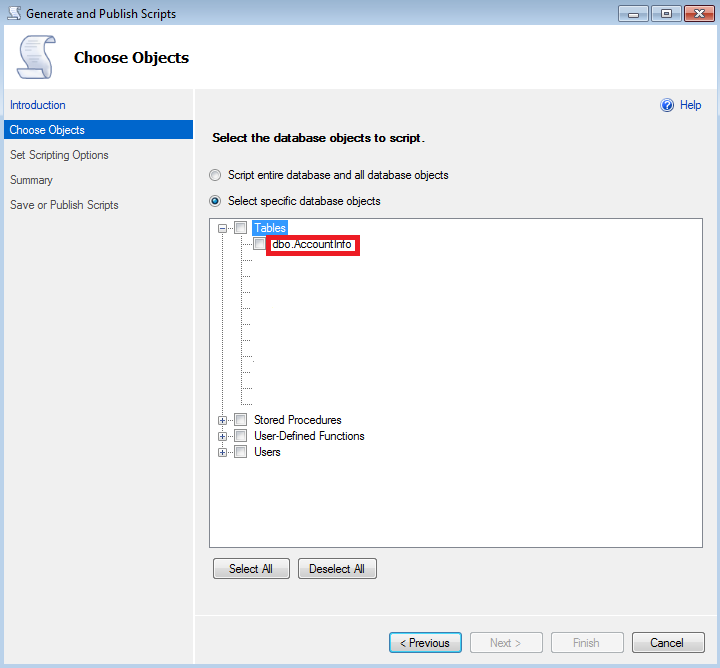 Choose “Select specific database objects” radio button, expand the tables and choose the table for which the data script needs to be generated and click Next. 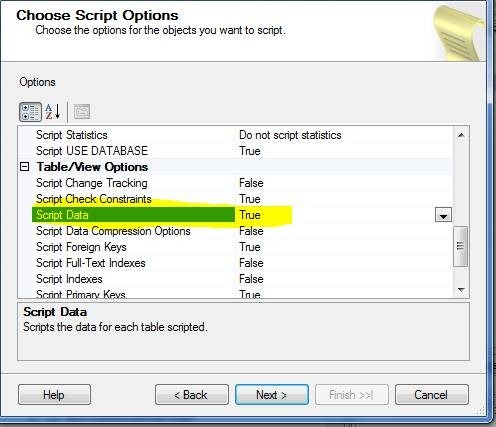 On the below screen, click “Advanced” and then select “Data only” option from the “Types of data to script”. By default “Schema only” option is selected. 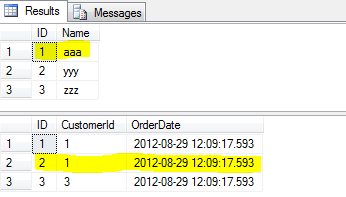 You can also select “Schema and data” option for both creating table and also for the insert scripts. Choose where to save the insert script (File/Query window/Clipboard) and click on Next.You can see the progress and will see the generated insert script. A) If your table has large amount of data (like mine in this case having 5000K records, Use the “Save to file” option to save the script and It will generate the script file containing all the insert queries just fine. 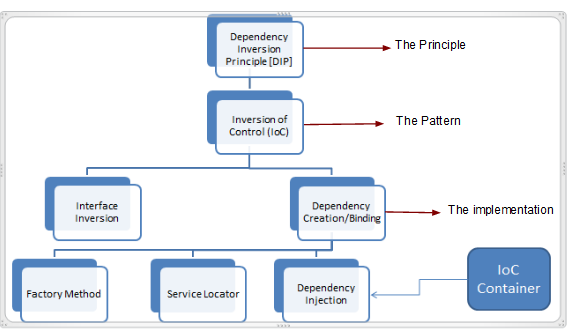 If you use “copy to clipboad” or a “New Query Window option”, the generation will fail with Out of Memory Exception. B) ALWAYS enclose the insert scripts in transaction with TRY CATCH block before running them. You don’t want partial inserts on your table – do you? 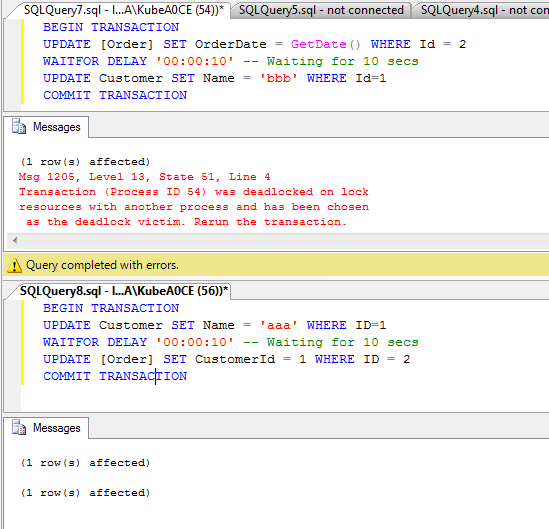 Good thing is you can generate the data script of SQL server 2005 database objects from SQL server 2008 management studio. This is how you do it. 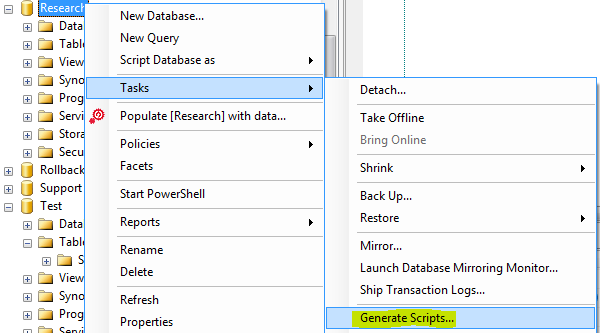 a) In the SQL Management studio, right click on the database and select “Task > Generate Scripts ”. A wizard will be launched. 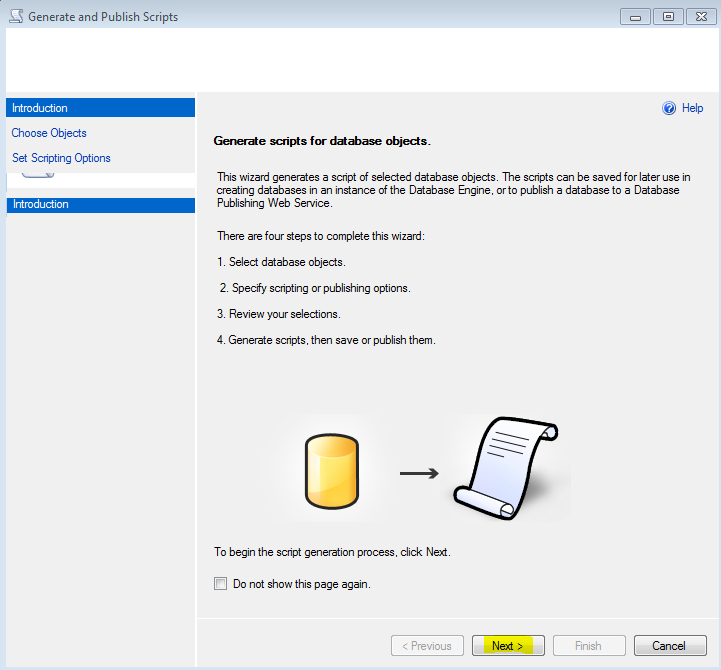 b) Select the database you want to generate the script from. 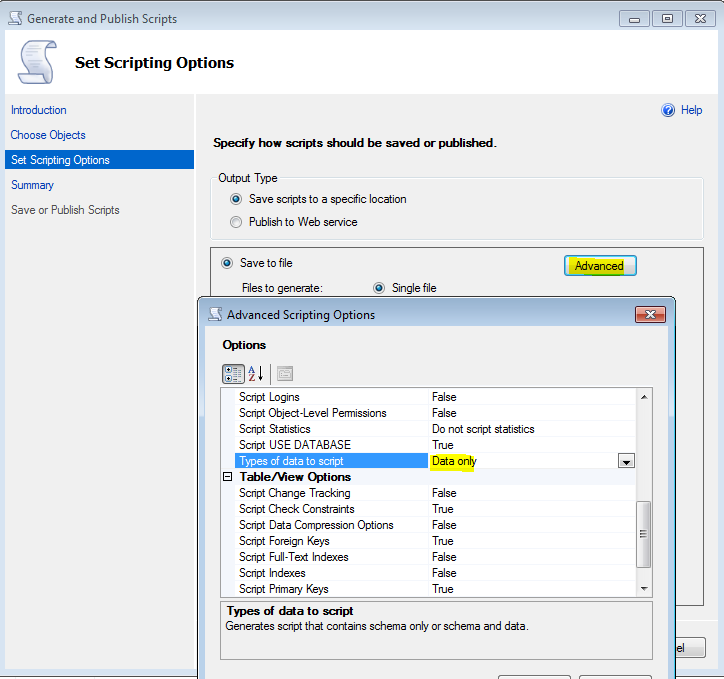 d) Proceed on to generate the script and It will generate the data script as well.